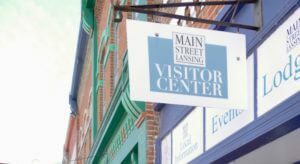 Founded in 1851, the Mississippi river town of Lansing, IA not only retains all of its historic charm and elegance, but also offers a resort-like setting for visitors from across the globe. Lansing is the perfect location for your next vacation. Downtown Lansing was designated a National Historic District by the National Register of Historic Places in 2014. With authentic period architecture, our downtown still looks like a true turn-of-the-century Mississippi River town. But make no mistake—behind those beautiful and historical storefronts and buildings, you’ll still discover plenty of life. Boutiques, antique shops, restaurants, and Horsfall’s Lansing Department Store (think Wall Drug with an Iowa flare) are sure to entertain and delight you. From authentic wooden boats and commercial fishing displays to buttons made from clams fished from the Mississippi River, you’ll discover what life was like in our town at the Driftless Area Education and Visitors Center, just south of Lansing along the Great River Road. The center also tells the story of the Driftless Area—how its unique landscape came to be and how varied wildlife thrive here. For many, the River is the main attraction at Lansing. For the boating enthusiast there are marinas—Lansing Marina and S&S Rentals—and boat ramps for launching into the Mississippi: Village Creek State Boat Landing at the south edge of town, Big Slough Landing just across the Black Hawk Bridge in Wisconsin, and the Upper Iowa River at Black Hawk Wildlife Area just 10 miles north on State Highway 26. Fancy a day at the beach? Put your boat in the River and head for one of the sandbars just north of town on the main channel. You can pitch your tent, too, if an overnight stay appeals to you. Are hiking and biking more to your taste? Lansing is located on the Mississippi River Trail and Mt. Hosmer Veteran’s Memorial Park offers several trail heads for hiking and mountain biking. In addition, you may want to tackle Mt. Ida, at the southern edge of town. Just three miles south, on the Great River Road, you’ll find the Allamakee County Trail. This beautiful spot is approximately two miles long and runs along the foot of wooded bluffs adjacent to the Mississippi. A mere mile away is the Great River Road, which takes you to the Riverland Conservancy trail head, a gravel track to the bluff top and access to 200 acres of woods and prairie with a 1.5 mile signed loop. Both of these are great for cross-country skiing and snowshoeing as well. If gravel road biking is your forte, then head to Columbus Road, Red Oak Road or Village Creek Road for a low-traffic, scenic environment. On the eastern edge of New Albin, 11 miles north of Lansing, is Army Road, a gravel and dirt road that traverses an exceptional expanse of wilderness. The road ends at a boat landing on the Minnesota Slough, a backwater of the Mississippi River. Of course it’s not about the landing, it’s about the journey. At the beginning you’ll find yourself on the edge of a plateau that provides a vista of what’s to come: a flood plain forest in the midst of an extensive expanse of wetlands. This environment supports a vast variety of wildlife: otter, beaver, deer, turtles, muskrats, frogs, and as many as 150 species of birds, including sand hill cranes, bald eagles, red-wing blackbirds, Prothonotary warblers, kingfishers, heron and geese, to name just a few. Be sure to visit and experience the wonder of Army Road. With Lansing as your base camp, take a drive on the Driftless Area Scenic Byway, one of the most popular scenic byways in Iowa. These 100 miles of road twist and turn through the hills and valleys of the Driftless Area, one of the few areas not flattened by glaciers thousands of years ago. For more area exploration, follow Iowa’s Great River Road. Visit any of the lovely river communities and take time to appreciate the variety of scenic stops. For a fuller flavor of our rich history, visit the Allamakee County Historical Society Museum in Waukon. Here you can experience what life was like back in the 19th and early 20th century. You can also tour a log cabin and schoolhouse from the 1870’s. Contact the museum for hours of operation. Take advantage of our proximity to Iowa’s only National Monument. Effigy Mounds National Monument—with 206 sacred mounds built by 18 American Indian Tribes—is also listed on the National Register of Historic Places. Just 24 miles south of Lansing, the prehistoric animal mounds await you. Stop at the interpretive center and then select your own walking route to see the mounds. For a shorter excursion located on just three acres, be sure to visit the Fish Farm Mounds prehistoric site, just 9 miles north of Lansing. We know you’ll love Lansing. You’ll also love the variety of places to stay. At night, rest your head at our motel, any of our cabins, or our B & Bs. Whether you’re visiting for the first or 15th time, we look forward to welcoming you to our beautiful Mississippi River town.